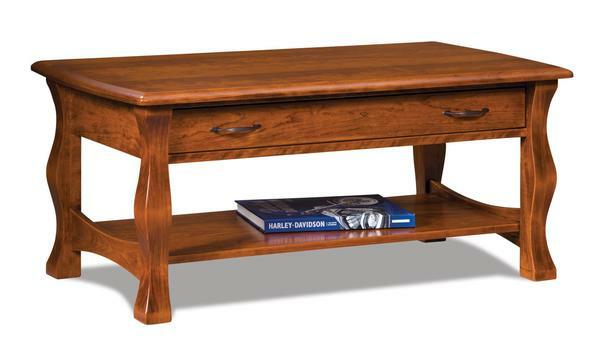 Breathe life into your living room with our Amish Reno Coffee Table with Drawer. Four flowing legs are the stand out on this accent table for the living room or office. A boat shaped top plays along with the gentle curves of the legs and provides a spot for coasters, drinks, snacks, remotes, and more. A full-extending drawer adds hidden storage. Shown in sap cherry with vintage antique stain, this piece can be custom made from a variety of wood types, finishes and hardware.